And I listened. Neat how that works right? Here it is in its almost 1 full repeat glory. 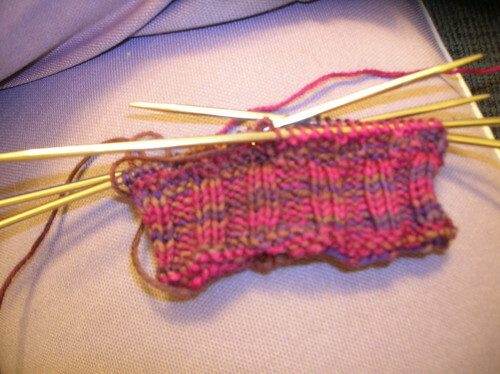 It really is very pretty yarn - I love the delecate brown between the purple and as Thomas calls it "Rasberry." 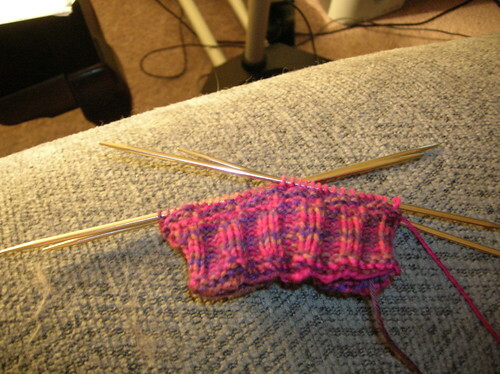 I've been playing Civilization Revolution on the Xbox 360 when not knitting.... that's pretty much taken up my weekend. Last night we went to dinner with one of Sam's co-workers and his wife. She's a great cook! Then we watched Iron Man on blu-ray, because they hadn't ever seen it, and really - I can watch movies 100s of times. So that's been pretty much it... days drag on but the weeks fly by. We're almost to Halloween! Raspberry? didn't I say Cranberry? It's beautiful! You are just prducing the prettiest socks. My son and I watched "Ironman" last week and we enjoyed it too. Make me thing of one of the creatures I made on Spore last night. Gosh. That makes me want to learn how to knit.